Who has been the best live show of Reading so far? We can answer that with one simple retort. 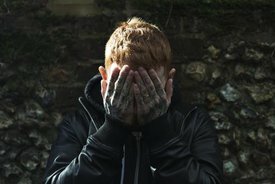 Frank Carter and the Rattlesnakes; why? Not least because we crowd surfed our way to the front of the show… twice. We didn’t even know the extent of our fandom until Frank Carter entered the stage, brightly clad in a stripy shirt and what looked like snakeskin trousers – and once again, we were thick in the action, caught up in an atmosphere of anticipation and pure joy. The band initially entered demurely, walking to their instruments calmly and clearly prepared to put on a good show. But Carter waltzed on stage, danced his way through the first number ‘Wild Flowers’ and by the second song ‘Lullaby’ had already entered the audience to walk his way across the shoulders of his fans. Dedicated to his daughter (who was very sweetly watching from the sidelines of the stage) ‘Lullaby’ was only the beginning of Carter’s demonstration of being a master puppeteer. By his third song ‘Vampires’ the crowd were asked to crouch where they stood, and hundreds were leaning into the sweaty body of the person in front in a bid to please - ourselves included. When asked to bounce, we bounced, when asked to carry Frank Carter like a King, we happily paraded him through the crowd, applauding him where he travelled. He was fun, he was energetic and we would follow him wherever he took us – and after 10 years of playing Reading, it’s not surprising he knew exactly how to please a crowd. The entire band should be hugely proud of their performance, creating a moment in time in which so many people can say, ‘I was there, and I did this, and it was amazing!’ Not often do bands offer the opportunity for people to feel special as well as safe, and we commend them for their thought and care with all of their fans – us included! Their set was phenomenal, their music created adventurers we didn’t know existed, and on top of it all they dared us to try something new. And who could possibly argue with the charisma and showmanship of Frank Carter and his Rattlesnakes? Not us.